On our return journey to Bharatpur, Chitwan, from the confluence point of the Rapti and Narayani rivers, Dr Anjal Prakash, Ms Ankita Shrestha and I stopped by Ramkumari Kumal’s house, in the village of Golaghat. We had come to Golaghat, in Meghauli Municipality, Chitwan, to do a situation analysis of the flood plains for HI-AWARE’s River Basins Programme. Ramkumari was seated in the porch fronting her house, just across from the courtyard, which abuts the road. The house was a small hut made of mud, fortified by grass stalks from the forest and topped with a corrugated tin roof. On the courtyard were a she-goat tethered to a stake, a hen confined to a nesting area made by a basket placed over it, and another mother hen racing around the yard with her brood of chicks. Across the courtyard, past a tube well, and beyond a short hedge-against which leaned a rusty bicycle-lay the family’s fields on which had been planted corn and pulses. Two katha of that family plot is farmed by Sita Kumal, Ramkumari’s daughter-in-law. As we approached Ramkumari, she stood up to greet us, and we noticed that she had to lift her right arm, which hung limp, with her left, in order to walk towards us. Her left eye seemed to bulge and walking seemed to take quite a bit of effort. As we got talking to her, we learned that she had suffered a stroke some six years ago, when she had been foraging for wood in the nearby forest, and had been carried back home by villagers. Ramkumari, who is 45, in many ways represents how difficult it is to get by for the most vulnerable members of society living in an area that is prone to floods and incursions by wild animals. The crops on the field that her daughter-in-law farms get eaten by the buffer zone’s deer, rhinos and wild boars. During the monsoon, the Rapti and Narayani rivers, whose confluence point is half a kilometre away, overrun their banks, and destroy all the crops. There is no early-warning system in the area, and the villagers have to make a run for it as the water sweeps everything in its path. For someone like Ramkumari, who can barely walk properly, on account of the stroke she has suffered, getting away can be exceedingly difficult. Today, Ramkumari is on medication for high blood pressure, an illness that probably caused her stroke in the first place. She is on amlodipine, as recommended by the doctors in a hospital in Bharatpur. Sita says that she and her husband would help Ramkumari get over the lingering after-effects of the stroke if they could, but they do not have enough money. It’s not that Sita and her husband haven’t sacrificed much for Ramkumari. Just until last year, Sita and her husband were working in an office pantry in Gurgaon, India, making tea for the office staff. Ramkumari was being cared for by her husband, but then he succumbed to a stroke, just last year. Sita and her husband decided to quit their jobs, and together with their six-year-old daughter, returned to their village, to take care of Ramkumari. But things haven’t been easy for the family. Sita’s husband cleans rooms at a hotel in Sauraha, for which he gets paid Rs 5,000 a month. Sita farms the 2 katha of land that has been bequeathed to her and her husband, but owing to the floods and the foraging wild animals, she doesn’t put much hope in the land’s harvests. She did work at a thread mill for a few months in the recent past, but the workplace was too dusty to continue working in, and the mill itself has now closed down. 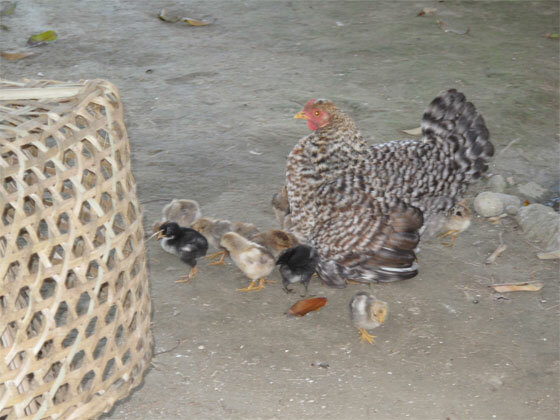 The chickens running around in the yard are not being reared to be sold and thus do not figure as a source of income. They will be sacrificed during ceremonies to propitiate the gods. The goat in the family’s yard actually belongs to their neighbour. They are only taking care of it on the neighbour’s behalf. When it has kids, the neighbour will get the goat back and the kids will be shared between the neighbour and Ramkumari’s family. The family will probably never be able to afford the treatment needed to alleviate the problems brought about by Ramkumari’s paralysis. Sita’s daughter is already of school-going age, and the family must save to put her through school. For families such as Ramkumari’s, who can’t depend for their livelihoods on their farms-situated in a flood-prone area ravaged by wild animals-one major illness in the family can affect everyone in so many adverse ways. Ramkumari hopes that the she-goat they are taking care of will give birth to female kids-for that will mean that she can then rear more goats. That is the only hope she hangs on to.